Atossa is a new kind of 3D printed shoes that are designed to fit specifically you and your feet. It features comfort, high quality and style at the same time. Initially Atossa was an idea of changing social and industrial systems that provide people with various products. They intended to use 3D printing for producing customized products. They also aimed to reduce the waste of energy and resources and to allow people get involved in producing things. The idea is to let people design things so as to give them the most suitable products. When it comes to choosing footwear, we face difficulties sometimes. They might hurt, not fit properly. We may feel not so comfortable wearing them, or else, if they are comfortable, they may not look good, and so on and on. We all feel that the currently existing shoe industry lacks something. Moreover, it seems as if producers do not pay enough attention to wearers’ specific forms. We all know that choosing inappropriate footwear may do harm to feet and joints. Atossa will help to produce the products that support the foot arches, balls and heels basing on the wearer’s specific characteristics. So wearing such shoes will provide comfort and prevent from any possible damage. Atossa producers have done a lot of research to find the organic structure that could be 3D printable. They also had to consider the solidity of the construction so that it could withstand the pressure of the user’s weight as well as their movements. Finally they came up with the microscopic bone texture. It is both strong enough and stylish to develop shoes. The final design has a re-arranged flexible structure that absolutely fits the heel, ball and arch. Wearers can also customize the shoes themselves using various straps. They may put in any way they can imagine. Apart from all the other advantages of such footwear, we should point that it is eco-friendly. It is made of PLA, which is obtained out of sugar beets, corn and potatoes. 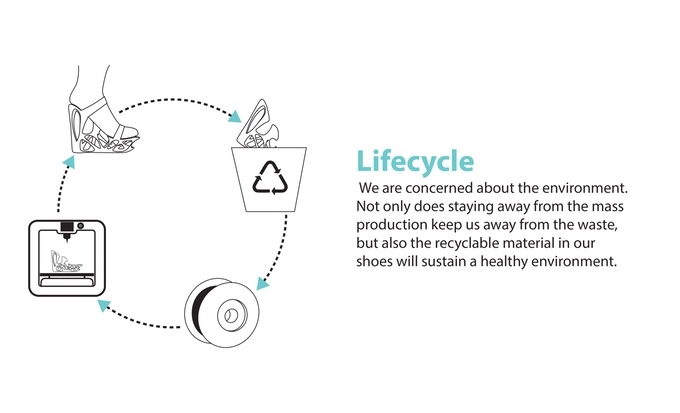 The company takes care of the environment, that is why they use recyclable materials for their shoes. There is a special Atossa app for both Android and iOS. Your capture your feet from three angles, then the app will help you to make a model of your feet and designers will design the shoes considering all the peculiarities of your feet. This project is not connected with any risks, except for the deadlines. However, they have come up with a solution – they have set up a flexible timeline.